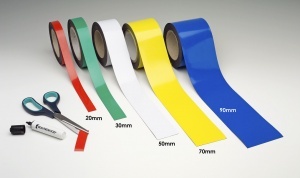 Use this simple but highly effective magnetic racking strip to create your own labels and identifiers in the workplace. This product is primarily used in stockrooms and warehouses to allow staff to quickly create identification labels. These are then placed on racking beams and posts to clearly mark the location of certain stock items. Use different colours to identify different types of stock or to help certain areas stand out more clearly. Using the product is as simple as cutting your desired length of strip from the roll with a pair of scissors and placing it in position. The magnet adhesion method means that you can remove the label and re-position as many times as you like - unlike regular self-adhesive stickers. There are five different widths available, we recommend that you choose the size that best suits the intended marker location. However, by choosing a wider strip you have the flexibility to cut down to a smaller size or create irregular shaped ID markers. We recommend the use of wet-wipe markers with these magnetic strips, these require a damp cloth to remove the ink but the text can't be accidentally smudged or wiped off. Permanent markers can also be used but once written on you will not be able to re-use the labels for any other purpose (markers not included).